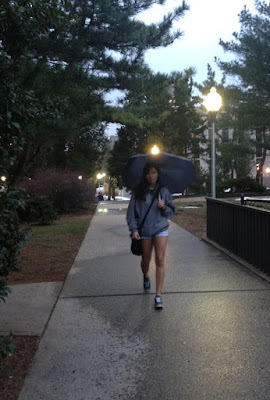 Hofstra Pride Guides: Raining? Not to worry! If you have visited Hofstra before, you know that campus is always bustling with fun things to do! Professors are holding classes outside on Calkins Quad, Hofstra cats are playing on Memorial Quad, and students are hanging out in Liberty Republic Garden. But what happens on campus when it's not so sunny outside? Pride Guide Matt gave us some great ideas for how to spend a rainy dat at Hofstra! Visit Axinn Library and catch up or get ahead on some classwork. While in the library, check out a new book! The 10th floor is a great place to start reading. Watch a movie with friends. Residential students have free HBOGo so there are plenty to choose from! If you're one to put on rain boots and splash around in the rain, campus is still beautiful in the rain. But if not, stay dry with a shopping day at Roosevelt Field Mall. Level up and play in the game room. It has air hockey, ping pong, and all the gaming consoles you'll ever need. If the game room doesn't meet your needs, join a game of Quidditch on the Intramural Fields, it's Matt's personal favorite - rain or shine! Head to one of the lounges in the Student Center or a residence hall and watch a throwback movie! Bonus points if it's Spice World or an orange VHS. Sign up for one of our free fitness classes in the Fitness Center, or enjoy running on our indoor track. Stop by the RA office and pick up some board games. Celebrate a productive day in the rain by having pizza delivered to your room from our on-campus Sbarro.